Selling for $16.95 0 0 Like this product? Big, Funny Valentine's Day Card. Made from heavy duty 4mm corrugated plastic, comes with it's own 'envelope', made from heavy duty cardboard. Ships in the 'envelope', complete with a big, funny stamp. This card is sure to be a favourite gift and will definitely stand out from the crowd! 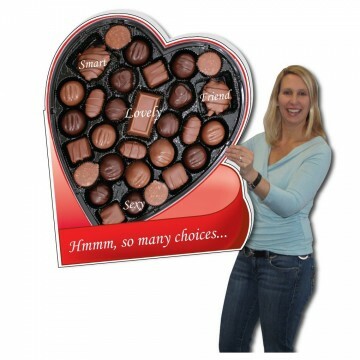 Big, Funny Valentine's Day Card. Made from heavy duty 4mm corrugated plastic, comes with it's own 'envelope', made from heavy duty cardboard. Ships in the 'envelope', complete with a big, funny stamp. Inside of card reads: You're my Box of Chocolates! Happy Valentine's Day! P.S. I know I don't take the time to tell you this enough, but I cherish your friendship, your love, and your willingness to spend your life with me. This card is small compared to the love I have for you!